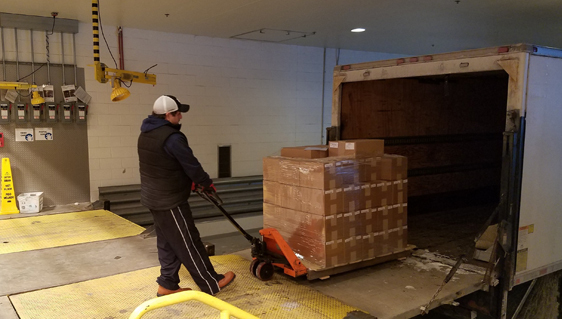 Freight Shipping Services | Blackhawk Express Freight & Messenger, Inc.
BLACKHAWK EXPRESS FREIGHT PROVIDES 3 DIFFERENT LEVELS OF SERVICE TO ACCOMMODATE ALL OF YOUR DELIVERY NEEDS. This is a dedicated service to deliver direct non-stop. This service also applies for any order that is ready after 2:00 p.m. to deliver by 5:00 p.m. (1.5 times the Standard rate). All orders ready after 3:30 p.m. bill as overtime. Order delivered within 4 hours of the ready time. This service also applies for any order that is ready after 11:00 a.m. to deliver by 5:00 p.m. (1.25 times the Standard rate). The cutoff time is 1:00 p.m.
Order called in and ready for pickup by 11:00 a.m. to deliver same day by 5:00 p.m.
Any order traveling outside a 60 mile radius of the Chicago Loop or traveling more than 60 miles is considered a Hot Shot. Please call our office for a price. Any order that picks up or delivers beyond our local area will be billed an additional 25%. If it is picked up and delivered outside our local area, it will be billed an additional 50%. The first skid/pallet position is free and each additional position is $15 or 1.5 cents per pound, whichever is greater of the two. A single position is a standard size skid/pallet at 40”x48”. Any item larger moves into an additional position(s). Any order that is not delivering dock to dock is considered an inside load. The charge is $50/hour. Any order that requires a lift gate is $50/hour with a minimum charge of $25 which includes the first 30 minutes. Orders that are not ready upon arrival have a $50/hour waiting time charge that starts immediately. Dock waiting time to get loaded or unloaded also bills at this rate with the first 20 minutes being free. An attempted pickup with product not available is a $50 minimum depending on mileage traveled. OT charges will occur for orders that need to deliver same day before 9:00 a.m. or are scheduled after 3:30 p.m. The price is 2 times the Standard rate. Since we are not a 24 hour operation, please place your overtime orders in advance or we may not have a truck available if you call too late. As for weekends, are office is closed, but our paging system will notify us of any calls. To assure yourself of a weekend delivery, please try and place the order on Friday (weekend rates are 2 times the Standard rate plus a $20 fuel surcharge). Our surcharge is based on the Chicago average for gas being over $4.00/gallon. Otherwise there is no charge.